As with all sciences, thermodynamics is concerned with the mathematical modeling of the real world. In order that the mathematical deductions are consistent, we need some precise definitions of the basic concepts. The following is a discussion of some of the concepts we will need. Several of these will be further amplified in the lectures and in other handouts. If you need additional information or examples concerning these topics, they are described clearly and in-depth in (SB&VW). They are also covered, although in a less detailed manner, in Chapters 1 and 2 of the book by Van Ness. Matter may be described at a molecular (or microscopic) level using the techniques of statistical mechanics and kinetic theory. For engineering purposes, however, we want ``averaged'' information, i.e., a macroscopic, not a microscopic, description. There are two reasons for this. First, a microscopic description of an engineering device may produce too much information to manage. For example, of air at standard temperature and pressure contains molecules (VW, S & B:2.2), each of which has a position and a velocity. Typical engineering applications involve more than molecules. Second, and more importantly, microscopic positions and velocities are generally not useful for determining how macroscopic systems will act or react unless, for instance, their total effect is integrated. We therefore neglect the fact that real substances are composed of discrete molecules and model matter from the start as a smoothed-out continuum. The information we have about a continuum represents the microscopic information averaged over a volume. Classical thermodynamics is concerned only with continua. A thermodynamic system is a quantity of matter of fixed identity, around which we can draw a boundary (see Figure 1.3 for an example). The boundaries may be fixed or moveable. 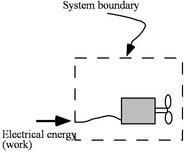 Work or heat can be transferred across the system boundary. Everything outside the boundary is the surroundings. When working with devices such as engines it is often useful to define the system to be an identifiable volume with flow in and out. This is termed a control volume. An example is shown in Figure 1.5. A closed system is a special class of system with boundaries that matter cannot cross. Hence the principle of the conservation of mass is automatically satisfied whenever we employ a closed system analysis. This type of system is sometimes termed a control mass. The thermodynamic state of a system is defined by specifying values of a set of measurable properties sufficient to determine all other properties. 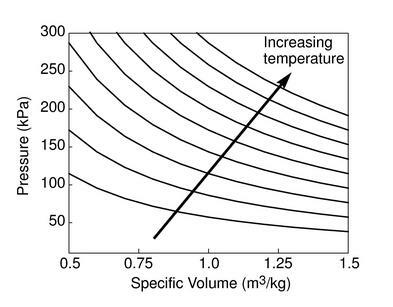 For fluid systems, typical properties are pressure, volume and temperature. More complex systems may require the specification of more unusual properties. As an example, the state of an electric battery requires the specification of the amount of electric charge it contains. Properties may be extensive or intensive. Extensive properties are additive. Thus, if the system is divided into a number of sub-systems, the value of the property for the whole system is equal to the sum of the values for the parts. Volume is an extensive property. Intensive properties do not depend on the quantity of matter present. 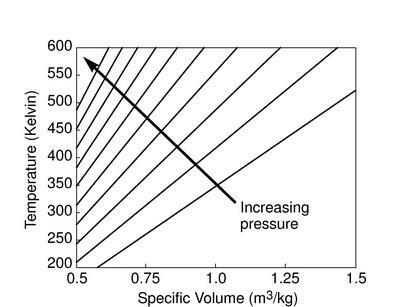 Temperature and pressure are intensive properties. Specific properties are intensive because they do not depend on the mass of the system. The properties of a simple system are uniform throughout. In general, however, the properties of a system can vary from point to point. We can usually analyze a general system by sub-dividing it (either conceptually or in practice) into a number of simple systems in each of which the properties are assumed to be uniform. It is important to note that properties describe states only when the system is in equilibrium. The state of a system in which properties have definite, unchanged values as long as external conditions are unchanged is called an equilibrium state. If the state of a system changes, then it is undergoing a process. The succession of states through which the system passes defines the path of the process. If, at the end of the process, the properties have returned to their original values, the system has undergone a cyclic process or a cycle. Note that even if a system has returned to its original state and completed a cycle, the state of the surroundings may have changed. The figures below demonstrate the use of thermodynamics coordinates to plot isolines, lines along which a property is constant. They include constant temperature lines, or isotherms, on a - diagram, constant volume lines, or isochors on a - diagram, and constant pressure lines, or isobars, on a - diagram for an ideal gas. Real substances may have phase changes (water to water vapor, or water to ice, for example), which we can also plot on thermodynamic coordinates. 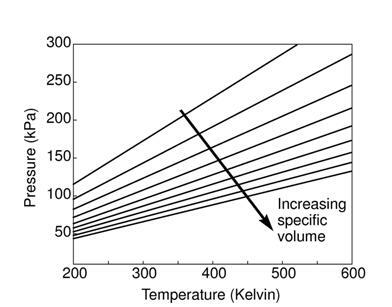 We will see such phase changes plotted and used for liquid-vapor power generation cycles in Chapter 8. A preview is given in Figure 1.15 at the end of this chapter. where is the volume per unit mass, . In words, if we know and we know , etc. where is the volume per mol of gas and is the ``Universal Gas Constant,'' . where R is , which has a different value for different gases due to the different molecular weights. For air at room conditions, .